It is either your first trip or your time to turn into seasoned globetrotter. And if you find yourselves stumble upon this article, the chance is you are in dire need of some rundown of what must-have items you may need to pack and you believe that somehow Russian people have this tendency to be a perfectionist so you want to peek into their comprehensive international travel checklist for references. Written below are 9 must-have items that Russian people bring for traveling. 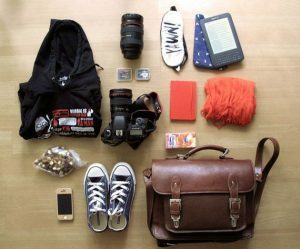 Do not forget to bookmark this travel packing must-have item list because you will want to refer to it as the D-Day gets closer. It will serve as a tool to tell you what to bring while traveling and help you make sure you have thought of everything you might want to pack. So, check it out. Soft luggage is not exactly what Russian people favor while traveling. You may also read 8 Must-Know Russian Luxury Brands for Handbags. Some of you may think that soft suitcases allow you more space to squeeze in extra items but then there would come the tragic time where you had to drag your luggage through the rain and you would not want to do it with a pathetic garbage bag over it get your stuff got soaked still. While wrapping all your clothes up in plastic bags could be a good alternative, maybe it is about time you wise up and get some hard-shell rolling carry-on luggage that has an expandable zipper that allows you extra space. Russian people are about practicality and it is ridiculous for them to bring five to six pairs of shoes with them on one trip. They would prefer to bring one pair of waterproof, durable shoes and another pair of shoes that are comfortable enough to use on long walks but can also work on any other occasions. So, it is important to bring a pair of shoes that serve as multi-purpose footwear. You will not risk getting sick at all costs during your travel, right? So, consider to stock up and bring various wipes with you to ensure minimal contact with germs and bacterium. Before you move from one spot to another, use wipes for your hands, your plane or train seats, the hotel room and well, it will also keep you feeling clean and fresh in all those public restrooms. Do not forget to run through your itinerary and work the worst-case scenarios possible. An accident is bound to happen so Russian people usually will come prepared and therefore, do some drugstore run and include some bandages, contacts rewetting drops or eye allergy drops into their traveling luggage. Also, do not forget to bring your daily multivitamins to keep you strong and energized on the road. Once you get going on a trip and experience many things at once, it is likely you will lose track of time until your stomach starts growling. Instead of ditching whatever activities you are doing and scrambling to find something to ease your famish, bring a box of energy snack bars with you. However, keep in mind that you should avoid ones with too many chocolate or ingredients that easily melt. You may also read 11 Most Favorite Russian Chocolate Candies. Imagine getting lost in a paper bag and needing a GPS attached to your body at all times. You use your phone for GPS all the time and it has basically become your sidekick while you travel. However, GPS is a saucy minx that consumes a ton of power in your phone. So between taking pictures to preserve the moment and navigating a foreign city, your cell phone almost always shrivels up and dies pretty quickly. The only solution to your problem is the power bank. Charge your power bank and pack it in your bag wherever you go so that you no longer spend your entire trip worrying about your phone dying. All you need to do is plug your phone into your power bank and you are pretty much good to go. There is nothing better for a long ride than a good book, be it a long train ride or a long plane ride. In addition, you never know when you will encounter some delays in your journey and need something to interest you during those long waits. You may want to try some Russian books to pass the time. You just cannot go anywhere without headphones especially when you are on a long trip. If you are a frequent flyer, I guarantee that your quality of life will increase exponentially when you bring them with you. Anyone who is a traveler often knows how stressful, tiring, and all-around loud it can be. And there are just so many things you cannot control while traveling. However, blocking out noise is something you actually can. It is not at all awkward for Russian people to bring trash bags their luggage. While hotel maintenance you are staying in tends to empty the trash before you arrive and could ever fill it up, you will not likely be throwing garbage in a trash can. Instead, you can use the trash bags to separate dirty clothes from the clean ones in your luggage. Always remember to keep the trash bag in your luggage so that the staff does not mistake it for actual trash. If you are not comfortable with using a trash bag for dirty clothes, then you can go with a mesh laundry bag. So, those are 9 must-have items that Russian people bring for traveling you can refer to. Do not forget to check every menial thing at your home before leaving because no matter how much you plan, there will always be something to overlook. I hope you enjoy your trip.